Where am I? 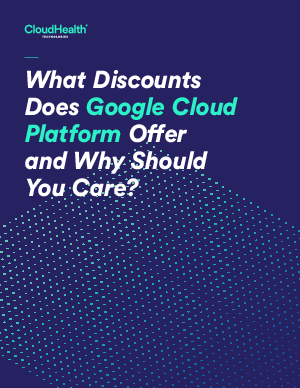 › Home > White Papers > CloudHealth by VMware > What Discounts Does Google Cloud Platform Offer and Why Should You Care? Google Cloud Platform is being widely adopted for its security and performance networking capabilities, machine learning, Kubernetes support, and data analytics. Google has been developing innovative price models to attract new users and provide cost benefits for customers. What are Committed Use Discounts? Why do you need Committed Use Discounts? What are Sustained Use Discounts? What is the difference between Committed and Sustained Use Discounts? Download GCP Discounts and Why You Should Care to learn how you can take advantage of discounts in Google Cloud Platform to save you money on your monthly cloud bill.